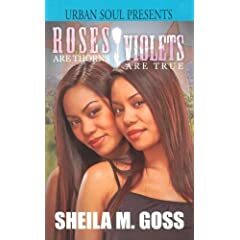 Roses are Thorns, Violets are True is not a story about your typical twin sisters. Rose's main goal in life is to stay in the spotlight; whether it be the star of her parent's eyes, or that of the silver screen. Violet, unlike Rose, prefers to remain behind the scenes and cherishes her privacy. In the past, regardless of the circumstances, Violet has always been able to forgive her sister’s hateful deeds. Well that is, until Rose does the unthinkable. Can these sisters ever be friends, or will they always stand divided? Violet Purdue gives a shocking interview about the life of Hollywood actress Rose Purdue, her twin sister, to a popular magazine. Violet voices her frustrations about Rose and her escapades, with the latest involving stealing her ex-husband, David, and tricking him into marriage. Violet also reveals to the reporter that she loves Rose, but she is still dealing with the pain of the betrayal.